For home foundation repair, concrete foundation repair, or garage foundation repair to be effective the cause of the cracks must be addressed as part of the solution otherwise any cement foundation repair will be a waste of time and money. 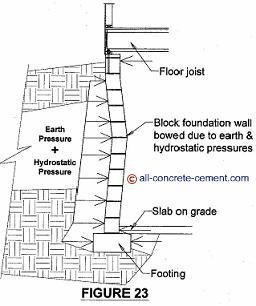 One of the causes of foundation cracks is earth pressure combined with water pressure exerted on the foundation walls. If the soil is saturated over long period of time due to water line leak, broken sewage line, irrigation overflow, improper drainage, etc this will lead to over loading the foundations which will lead to cracking. The cracks caused by water pressure are called stress cracks which is different from shrinkage cracks which are expected to happen to all concrete surfaces. Any permanent solution repairing stress cracks will have to include repairing the cause of the cracks such as ground saturation. To prevent foundation problems, it is a good practice to always examine the ground at perimeter of the house looking for signs of water buildup or broken water line. Figure 23 depicts how these pressures caused block foundation wall to be bowed. A horizontal crack at mid span of the foundation wall is a sign that a foundation has bowed. The arrows shown in the sketch represent the direction of pressures or forces. On the left side are arrows representing the combined earth & hydrostatic pressures. On top of the wall is the push back force that resist the wall from leaning. This force is provided by the anchor bolts,floor joists, and floor sheathing nails. At the bottom, the floor slab prevents the footing from sliding. The weak points are at mid-height of the wall because there is nothing to resist the pressures from exterior except the wall itself. Horizontal cracks at mid-height of foundation are sign that the foundation has bowed. The soil pressure itself is very minimal only a few feet of the soil will lean against the foundation. It is only when water is introduce into the mix that the problem escalates. A proof of this can be found in the fact that most soils are self supporting. With the exception of sandy and silty soils, one can safely work at 8+ feet deep hole without the soil caving. Let it rain for a week and you will find the same hole is no longer safe to come within feet of the edges before the soil cave in. When soil is soaked it behaves like water and flow to the lowest point. A basement is a low point and will attract the flow of water mixed soil protected by foundation walls. This lies the challenge that the foundation wall has to resist. When the soil is saturated it can be 10+ feet of water mixed soil leaning on the wall. If the foundation was not designed to resist these pressures, which most homes weren't, it can be a costly repair.